Learn about the Idaho’s great skiing country by reading Winter Fun in Idaho-ho-ho by Charlie Spence, Travel Writer and WTA Member. It features a mini, but thorough tour of the destination, plus all you'll need to know to plan your trip including getting there, objective information on places to stay and eat, and things to do. At the end of the article, we've provided a summary of the contact information for your easy reference. Enjoy! When the wintry winds start blowing, some folks hunker down and hibernate; others head for the sunny climes, while many seek out the snow-blanketed trails and slopes. One of the top places to play in the winter is the state with some of the most varied scenery and recreational sites in the country—Idaho. Whether a beginner or a seasoned expert, the deep-packed snow beckons under ice-blue skies. Almost any part of the state offers a diversity of winter playgrounds. 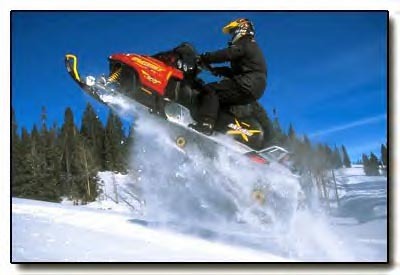 Idaho has 17 basic Alpine ski areas, 35 trail networks for Nordic, and 7,200 miles of snowmobiling trails. Since Sun Valley opened up the area in1936 as a winter playground, Idaho has been increasing the offerings of snow recreation opportunities. On the west side of the Rockies, Idaho misses much of the cold arctic air that sweeps into the eastern states while still getting the heavy snowfalls that make for excellent winter sports conditions. Idaho has so many fine places for lovers of winter that it is difficult to select any one area. Pick almost any part of the state and there’s a ski resort to suit your talents and your wallet. For these suggestions of travel destinations, we have selected only the southwest portion of the state, principally because of its main city, Boise that is easily accessible. Boise itself lures visitors for its many attractions. Founded in 1863 as a military outpost along the Oregon Trail, the city offers many recollections of this historic era, worthy of several days’ visit before heading to the ski runs. Throughout the state, the Idaho Department of Parks and Recreation provides plowed parking and restrooms. Snowshoeing is allowed on most trails, but it is wise to check first. Just 16 miles north of Boise you’ll find Bogus Basin with 52 runs for skiing down a 1,800-foot vertical drop. The average snowfall is 250 inches. There are lodges at the base and at mid-point. Skiable terrain is 2,600 acres during the day and 165 acres at night. The season usually runs from right after Thanksgiving until April. To the west of Boise is the long-popular Sun Valley. Bald Mountain has a 3,400-foot vertical drop, 14 lifts, and 65 runs. Wide ranges of accommodations are available, and there are package plans, shopping, dining and apres-ski facilities. The Friedman Memorial airport is near with regular airline service and daily direct flights from Los Angeles during the ski season. Ground transportation to the area is available from the Boise Airport that is served by several scheduled airlines. About 100 miles north of Boise, the area around the town of McCall provides the site for suburb outdoor activities. McCall has earned the title of "Ski Town USA" because it is the home of several Olympic skiers. It is located on the shores of Payette Lake (which also makes the area an inviting resort area for a summer get-away). The area offers Alpine and Nordic skiing and snowshoeing. Just three miles outside the city is the Little Ski Hill Alpine ski trail. The drop here is 405 feet and there are four runs. It is a fine place for the less-experienced skiers as well as their more experienced companions. Eight miles north of McCall, Brundage Mountain offers a 1,800-foot drop with 51 runs. If you like taking off on your own, all of Idaho’s snowmobile trails are clearly marked, but if you want to go off the trails, it is wise to hire a guide to show you through the picturesque landscapes. For the Nordic skiers who seek variety, the Idaho Department of Parks and Recreation operates a program called Park N’ Ski—thirteen separate areas across the state. You may purchase an annual or temporary permit to enter the park areas without paying the regular entrance fees on each visit. Snow tubing is another unique sport you will find just two miles south of McCall. This is the fastest growing winter sport. It requires no lessons and no equipment. Participants sit in a comfortable tube and enjoy a cushioned ride down hill. The snow tube site here carries you over a 700-foot long path on an 85-foot drop. Some of the resorts are family oriented while others offer relaxing apres-ski activities, excellent restaurants, and lively nightlife. Each part of Idaho offers breath-taking beauty and each offers something a little different. Air service to Idaho is available from scheduled air carriers at six cities in the state, including Boise and Sun Valley. The Boise Airport boasts an average of 280 days of sunshine a year. Flights to and from Boise make connections in 23 different cities, primarily in the west. For airlines that serve, and schedules, check their web: http://www.cityofboise.org and click airport. You can also check rates and book your room and rental car at WTA's Online Travel Booking Service Hotel savings can be significant.